El Camino Real de Tierra Adentro, the “Royal Road of the Interior,” was the earliest Euro-American trade route in the United States. In the United States, the trail spans 404 miles descending the Rio Grande Valley from the San Juan Pueblo, New Mexico to El Paso, Texas. From there, the trail continued roughly 1,000 miles south to Mexico City. 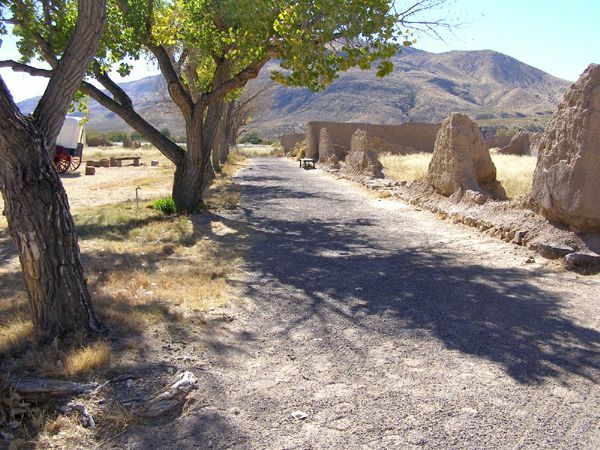 This Spanish colonial “royal road” represents 300 years of history helping make possible Spanish exploration, conquest, colonization, settlement, religious conversion, and military occupation of a large area of the borderlands from 1598 to 1885. For a time, it also enjoyed the distinction of being the longest road in North America. Long before the Spanish arrived in the area, American Indians had already established trade routes for commerce between tribes as well as with the ancient cultures in present-day Mexico. These footpaths, such as the Rio Grande Pueblo Indian Trail, were likely established around 1000 AD and branched throughout the northern Rio Grande region, spanning south through the Rio Grande Valley. When Spanish Explorers first entered the area in the early 1500s, American Indian peoples often guided them through the unfamiliar and daunting landscape. Spanish conquistadors and colonizers created what would eventually be known as El Camino Real de Tierra Adentro by connecting the old indigenous footpaths and Mexican trade routes. In 1598, explorer Juan de Oñate led the first colonization expedition 1,500 miles north of Zacatecas, Mexico into present-day New Mexico. Oñate, along with settlers and herds of cattle, traveled through the arid Chihuahua Desert and crossed the Rio Grande River at modern-day El Paso. The journey continued north through Las Cruces, Socorro, Belen, Albuquerque, and Ohkay Owingeh (San Juan Pueblo), which Oñate declared the capital of New Spain. The final leg brought the Oñate expedition to Santa Fe in 1603. 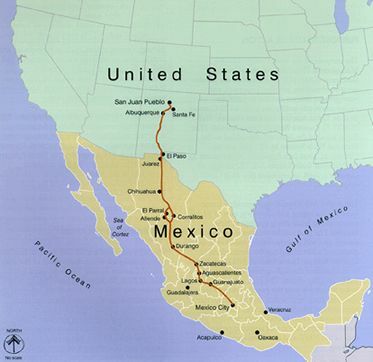 Oñate’s trail from Zacatecas to Santa Fe completed what would be known as El Camino Real, connecting the interior of New Spain to Mexico City. For the next 300 years, El Camino Real was the only wagon road into New Mexico and the Southwest, bringing thousands of colonists, missionaries and supply caravans from Southern New Spain into newly established Spanish towns that dotted the Rio Grande. The trail facilitated the introduction of horses, cattle, European agriculture and irrigation systems, exotic flora, and many cultural practices that still flourish in the region today. Many of the historic parajes (campgrounds) and early settlements created by the Spanish colonists moving along El Camino Real are today’s modern cities along the Rio Grande. In 1600, the capitol of Nuevo Mexico was moved from Ohkay Owingeh (San Juan Pueblo) to nearby San Gabriel del Yungue, and in 1610, it was moved for the last time to Santa Fe. Once these settlements were established, the trail became a lifeline back to central Mexico serving as the principal avenue of communication, commerce, and religious conversion. Goods flowed back and forth, much of which was carried in wagon caravans, which also transported livestock, royal decrees, mail, and mission supplies. People headed north included settlers and newly-appointed officials, while those headed south included retiring officials, friars, traders, convicts, and prisoners of war. Traffic over the trail came to an abrupt halt in 1680 with the Pueblo Revolt erupted which forced all Spanish residents to leave Nuevo Mexico and retreat south to the Rio Grande Valley. Three missions were built during their stay in that area: Isleta, Socorro, and San Elizario, all of which still stand. 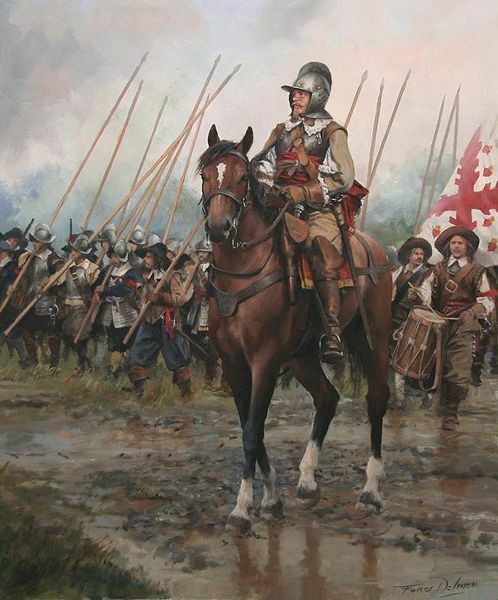 In 1692, however, the Spanish army, under Diego de Vargas, reconquered New Mexico and recolonized the formerly-abandoned pueblos and missions. The trail remained active throughout the Spanish period to 1821 when Mexico claimed its independence from Spain in 1821. At this time, New Mexico was supplied by both Camino Real and the Santa Fe Trai, from the northeast. After the Civil War, El Camino Real began to wane. Long distance traffic over the trail ceased when the Atchison, Topeka and Santa Fe Railroad was completed from eastern Kansas to Santa Fe in February 1880 and on to El Paso in June 1881. This historic route in the United States became a National Historic Trail in 2000. It is administered by the National Park Service and the Bureau of Land Management, in partnership with numerous landowners, tribes, and other agencies. Along the trail are many historic destinations that are listed in the National Register of Historic Places. Hiking trails welcome travelers and tourists along the historic route and much of El Camino Real is easily accessible by car. El Rancho de las Golondrinas, translated to The Ranch of the Swallows, was a ranch established by Spanish colonists by about 1710. One of the oldest, continually operating ranches in the Southwest, it once served as a paraje (rest-stop) and trading point along El Camino Real. Today it is a living history museum featuring 33 historic buildings include plazas, a mountain village, a working water mill, a church, schoolhouse, blacksmith shop, general store, winery, and other adobe and log buildings. 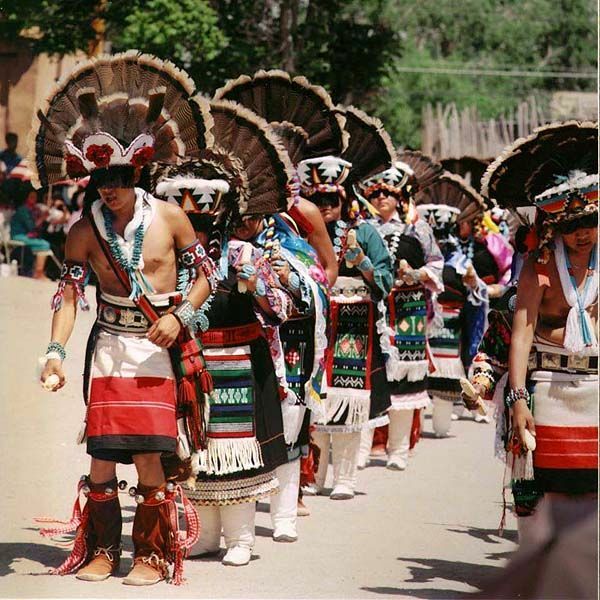 The museum interprets the heritage and culture of 18th and 19th century New Mexico. It is located about 15 miles south of Santa Fe. Santa Fe itself was a thriving center of commerce at the time, especially after the Santa Fe Trail connected New Mexico to the eastern United States for the first time in 1821, and the Old Spanish Trail similarly connected Santa Fe to the west coast at Los Angeles, California in 1829. With the three trails feeding the market from the south, west, and east, the Santa Fe Plaza at the center of town became a teeming hotspot for trade and social interaction. The plaza is a National Historic Landmark listed in the National Register. It features buildings constructed in the Pueblo, Spanish, and Territorial styles that reflect the diverse cultural history of Santa Fe. The Palace of the Governors on the north side of the Plaza is well worth a visit. Built in 1610, it is the oldest continuously occupied governmental building in the United States. The palace is a National Historic Landmark and a museum. Like Santa Fe, many towns along the trail greatly benefited from commerce and cultural exchange. One of the most intact is Mesilla, New Mexico established in 1848, which helps take visitors back in time through extant colonial architecture, museums, and cultural programming. The town’s central plaza is listed in the National Register and is a National Historic Landmark. It is home to quaint gift shops, galleries, and dining establishments, and hosts cultural events such as the annual Cinco de Mayo celebration. The early days of El Camino Real brought waves of friars and priests into New Mexico who built missions among the native Pueblo people, converting them to Christianity. 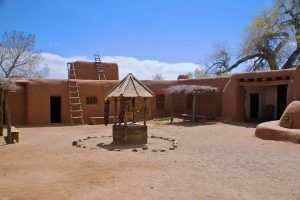 Dozens of missions were built at the larger pueblos and many still exist and are in use today. Both the Ysleta and Franciscan Socorro Missions in El Paso, Texas were constructed to help displaced American Indians who fled the Pueblo Revolt in 1680. Both are on the National Register of Historic Places. El Camino Real also boasts a strong connection to Civil War History as the trail continued to be heavily used throughout the 1860s. 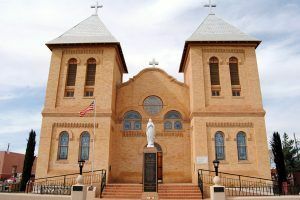 The Register-listed Presidio Chapel of San Elizario in El Paso, for example, housed volunteer fighters from California, stationed there to prevent reoccupation of the area by Confederate forces. Visitors may also enjoy a trip to Fort Selden State Monument in Radium Springs. Established in 1865, the adobe structure housed units of the US Infantry and Cavalry meant to protect new settlers from hostile American Indian tribes. African American units, referred to as Buffalo Soldiers, were stationed at the fort. The site features a visitors’ center, exhibit space, and guided tours. Visitors to the El Camino Real National Historic Trail have many opportunities to learn more about these early people through the built environment and cultural remnants they left behind. 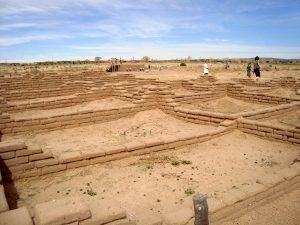 Kuaua Ruin (Coronado State Monument) in Bernalillo, New Mexico, features the archeological remains of a Tiwa settlement from around 1300 AD. A Works Progress Administration excavation of the site in the 1930s revealed a square kiva with many layers of mural paintings. Today the site represents some of the finest examples of Pre-Columbian mural art in the United States and is open daily for visitors. 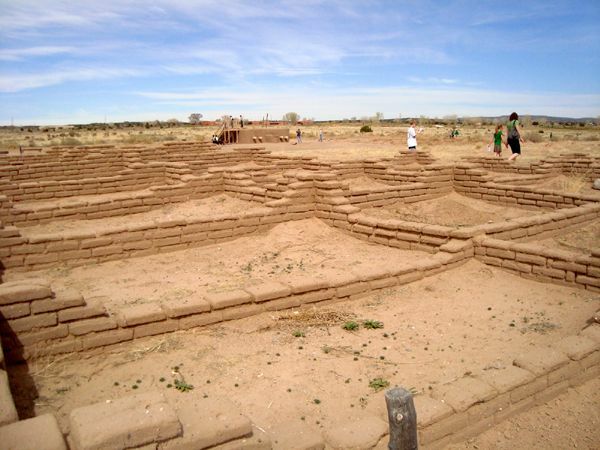 The Kuaua Ruin is listed in the National Register of Historic Places.